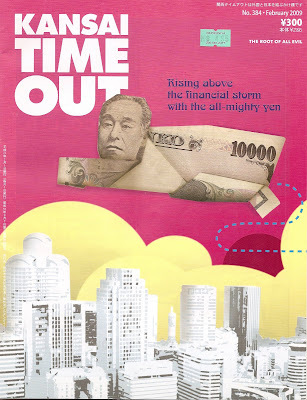 During a recent trip to Uwajimaya (the Japanese grocery store here in Seatte), I picked up a copy of the February issue of Kansai Time Out, a magazine I'd read frequently while I was living in Osaka. Now, I am usually not the type of person to ever write to an editor but after reading a letter they'd published called "Easy Does It" written by a KT Williams in Kobe, I couldn't help myself. I wrote the entire response before I went to bed and emailed it the next morning. Since I probably sent it too late to make the March issue and because it might not be timely enough to make the April issue, I am including what I wrote below. My pet peeve is people who whine about "globalization." I remember reading something in your magazine last year about Buy Nothing Day and it really upset me. Therefore, I feel that I must educate some of your younger readers about what Japan was like BEFORE Costco, Starbucks, Amazon, etc., arrived and made our lives here so much easier. I remember walking into a supermarket for the very first time shortly after we moved to Japan. Shopping for basic groceries was a nightmare! I couldn't read anything on the labels. I bought ajar of spaghetti sauce and it tasted terrible. They didn't even have diet soda. I drink Diet Pepsi but I would have settled for Diet Coke or even Tab if they had it. A friend of mine tried to cheer me up by suggesting that I try some of the local food. I told her I didn't come to Japan to eat Japanese food. I want to eat what I ate back home (I'm sorry if this sounds selfish, but I am very picky about what I eat.) I couldn't even find Doritos for my kids. I asked my parents to send a couple of bags, but sending chips in the mail was not the smartest idea. Needless to say they arrived smashed to bits. I almost tore my hair out in frustration! Full disclosure: I I-o-v-e coffee. (Do not even try to talk to me in the morning until I've had at least three cups.) I remember going to a coffee shop near our house. The owner was a very nice lady and we had a pleasant chat, but I wasn't very happy when I saw the bill: A thousand yen ($10) for coffee and toast! My friends back home stared in disbelief when I told them this story. I'm sure your readers can figure out where this is going. Yes, I do all my shopping at Costco (I haven't been inside a Japanese supermarket for over seven years). I drink my coffee at Starbucks three or four times a week. I buy all of my books and DVDs from Amazon, I'm sorry if that doesn't sound "politically correct," but I'm not going to change my lifestyle to please others. Besides, there are PLENTY of people who feel the same way (having pizza and hot dogs at Costco has become a Sunday tradition for plenty of foreign AND Japanese families in Kansai). It's time for everyone to face the fact that the world is getting smaller and that shopping is a good thing that brings many people happiness. Buy Nothing Day is a waste of time that will accomplish absolutely "nothing" (pun intended). Instead of complaining, we should be writing "thank-you" letters to these wonderful corporations for enriching our lives. Every voice counts. lf we"think locally" and "act globally" (to borrow a phrase), we can improve our lives in Japan AND stimulate the economy at the same time. Thank you, Sensei, for taking the time to "educate" us younger readers. ("Sensei" being the Japanese word for "teacher". "Japanese" being that non-English sound you hear around you on your walks to "hot dog night" at Costco.) I was surprised to hear how much the "Japan before Costco, Starbucks and Amazon" you described sounded a lot like… oh, what's the word? That's right… JAPAN. What were you expecting? The entire premise of your letter is "I moved to another country and (scream!) everything was DIFFERENT!!" What a depressing way to experience life. I remember walking into my first Japanese supermarket and being delighted that I couldn't read anything. Grocery shopping was an adventure! Sure there were some missteps along the way (I had a friend who itched for days before realizing her "bubble bath" was tub cleaner) but, had I never ventured from my safety zone, I would have missed out on so many wonderful new tastes and experiences. And what a sense of accomplishment to discover products I liked and to reach a point where I could shop with confidence and without a dictionary. I'm sorry to hear that you seem so unwilling to enjoy this process. And, while there's nothing wrong with having access to comfort foods while overseas, your "my way or the highway" attitude is laughably inappropriate and your little diatribe makes you sound like a crotchety old man screaming "get off my lawn" to a group of kids playing in their own yard. You are the guest in Japan, not the other way around. You talk about how these "wonderful corporations" can "improve our lives" but, here's the thing: Some lives don't need improving. Japan has a rich and long history and, believe it or not, some of us actually like that. We're the type of people who, instead of saving some cash by having a coffee we can now buy damn-near anywhere on the planet, would rather spend a few hundred yen extra for the experience of a proper Japanese coffee, all the while supporting smaller, local businesses (and yes, even stimulating the economy). We like the differences. We embrace the challenges. We love Japan for being Japan. And WE sure as hell don't want it to change to please YOU. May I make a suggestion? If you truly are more enriched by massive global corporations than by local culture and if you honestly find more happiness in consumerism than in connecting with the residents of this fascinating country, do us all a favor: go home. We'll have a bag of Doritos waiting for you. What an odd letter. "KT" is simultaneously boasting about how long he/she has been in Japan and complaining about how awful Japan is because they don't, in most cases, stock their store shelves with enough familiar products to meet KT's needs to never try anything new. I'm not going to condemn CostCo or anyone who shops there (hello, ME) but my trips to CostCo are special occasions to load up on stuff like bagels and cheese. The rest of the time we just go to the local supermarket and, you know, buy meat and fish and vegetables. That stuff doesn't require much reading. Neither does picking out chips in the snack aisle, where there's a ton of choices that taste a hell of a lot better than Doritos.